My favorite way to cook kale recently is by blanching it. It takes only a few minutes, and can be used in a variety of ways afterwards; my favorite being salads. 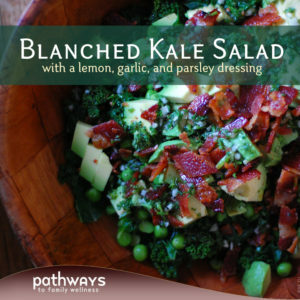 Now I know I am getting as many minerals as possible from the kale; can enjoy a warm(ish) dish, which is especially beneficial in the winter; AND having a salad (which happens to be one of my favorite foods) all at the same time! While a little raw garlic gives it the kick. Which brightens the whole dish. You can have ready quite quick. Bring about 4 cups of water to a boil. Add chopped kale and allow to blanch for a few minutes. Drain. Cook peas to packages instructions and set aside. Cook bacon (or other protein) to desired consistency. I tend to like it a bit crunchy for salads. Mix together all your dressing ingredients in a small bowl. 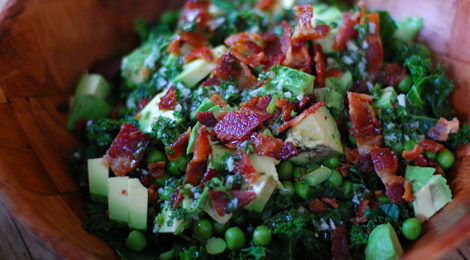 Add blanched kale to a separate, serving bowl with peas, bacon, avocado, and top with dressing. Serve as is or with an egg on the side.